Remember back when I relaunched my blog? Well, Emily was my giveaway winner and we just finished up over the weekend after starting her design in December! (Can you guess the big event that was taking up this girl’s time in November?) She was looking for something girly but clean that would compliment the two main topics on her blog: fashion/beauty and politics. She pointed to Your Southern Peach, The Magnolia Pair, and Seventeenth & Irving as a few examples of looks that she loved. I love how it turned out- make sure you go check out Blue Dog Belle for yourself! Emily is awesome- I actually got to meet her in person at Blogger Blitz back in June! Overall, I love the redesign. But I always have trouble reading really thin fonts like Raleway that seem to be everywhere on pretty blogs. Yeah, it’s a fine line (pun intended?) I try to only use them on headlines or places where they’ll be larger or easy to read, but sometimes due to browser compatibility it’s still tricky. If you haven’t already you might want to download Raleway or any other super thin ones that are common- sometimes if you have the font downloaded onto your computer it makes it a little less grainy and easier to read. Great job! Love the color palette! 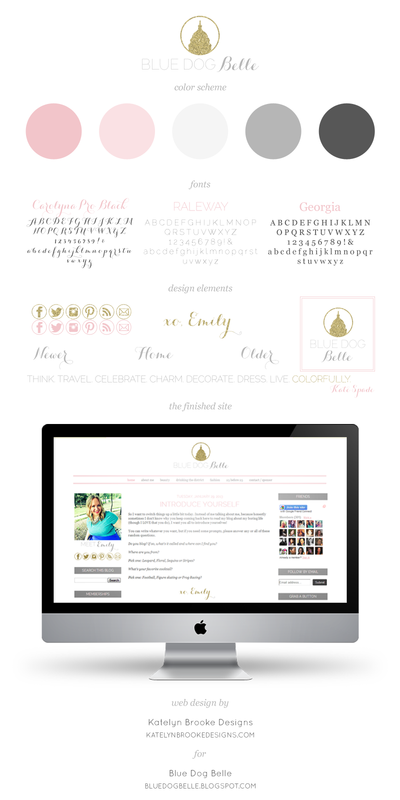 I love Emily and I love what you did with her blog! What a pretty, girly color palette. Congrats to Emily! Her blog looks fantastic. Great job!